The global water crisis and the lack of clean water oppresses people in extreme poverty, especially women and girls, who walk an average of 6 kilometers to get water. Globally, 844 million people live without access to safe water within 30 minutes of their home. This year on World Water Day, World Vision renews our 5-year commitment to reach 20 million people with clean water between 2016 and 2020, and to reach every person, everywhere we work, by 2030 — a total of 50 million people. Why such a big goal? We believe every child deserves clean water at home, at school, and at their community health clinic. It’s not a matter of convenience; it’s a matter of life and death. On top of our global goal, World Vision has set its sights on bringing universal access to clean water to all World Vision program areas in Rwanda by the end of 2022. 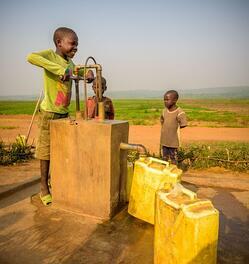 About 1 million people in 2,000 communities where we work in Rwanda lack basic access to clean water. We are committed to bringing water to every last one by the end of 2022. Rwanda, a small country of 11 million people in east-central Africa, is still emerging from the shadow of the 1994 genocide when as many as 800,000 people were killed in ethnic conflict over three months. World Vision began working in Rwanda that year, responding to intense humanitarian needs as well as needs for healing and peacebuilding — for Christ’s living water as well as clean water. The country has made progress in development, including in providing citizens with access to clean water. Yet, only about half of the rural population has adequate water coverage, and 77 percent of the rapidly growing urban population draws water from improved sources. That means about 6 million people in Rwanda struggle to access the water they need. 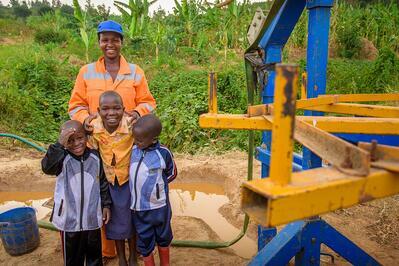 Angelique pictured with her three children next to a World Vision drilling rig. In all we do in Rwanda, World Vision strives for children and families to have health, education, protection, spiritual nurture, and economic opportunities to live out their God-given potential. Community members contribute time and labor to build and manage their water systems. Everyone learns hygiene practices to prevent water-related diseases. Angelique Hakurinka, 33, who lives in Gashora, near Rwanda’s capital, Kigali, is not one of the millions of women who carry water for long distances each day. She helped to bring water to her community as a member of a manual well-drilling team trained and equipped by World Vision. Where appropriate, manually drilled wells can save 80 percent of the cost of drilling with a heavy rig. 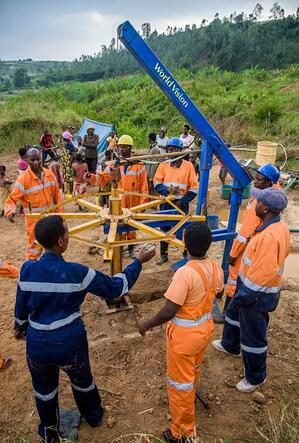 A drilling team drills a new well in Rwanda. For Angelique, who supports three children, and for her community, partnering with World Vision for clean water has been a life-changing experience. As the leading nongovernmental organization providing clean water access, we have the capability and a proven community-based model for success. We have strong government and private sector partners who are committed to universal water access. We also have momentum: From 2012 to 2017, World Vision brought water and sanitation services to more than 340,000 people in Rwanda. Globally, in the past five years, we’ve brought clean water to 14 million people. Every 10 seconds, we reach one new person with clean water and reaches three more schools every day. With the help of generous donors and partners, we believe we can meet our 2022 goal in Rwanda and 2030 global goal.